Although lipedema is a disease that has been identified as such for about ¾ of a century, amazingly many – particularly women – do not know it actually exists. Even among physicians, the knowledge about this condition is often sketchy at best and because it is poorly understood lipoedema is frequently misdiagnosed as obesity or as swelling of the lymphatic system (lymphedema). Lymphedema is very similar in its appearance to lipoedema but has entirely different causes. Unfortunately, a number of individuals can develop lymphedema additionally due to complications from lipedema. Due to the fact that there is still very limited knowledge and research about this type of fat disease, the treatment options consist mainly of conservative measures, such as compression bandages and garments, manual or intermittent pneumatic drainage as well as physiotherapy. Only very recently surgical intervention with liposuction has been added. Regrettably, many insurance providers currently do not cover any surgical procedures such as liposuction for this illness. Compression stockings or compression sleeves need to be worn after liposuction surgery to prevent complications and fluid accumulation in the affected arms and legs. If lymphedema is present, compression garments can help facilitate better drainage of fluid thereby also reducing the swelling. Standard size graduated compression stockings are based on the assumption of the legs being tapered from smaller at the ankles to largest at the upper thigh area. For lipoedema or lipo lymphedema sufferers however, the legs can be shaped very differently with bulges, fat pads and indentations in varying locations along the leg. In such cases, it is very important that strong consideration is given to the shape of the patient’s legs before determining what type of compression garment would work best for them. To be most effective, compression garments can be custom made to accommodate the individual’s irregular leg shape. Treatments that generally work for swelling, such as elevating the legs or using diuretics to eliminate excess fluid, will have no effect for patients dealing with lipoedema. What are the Characteristics of Lipedema? In simple terms this disease also known as lipoedema could be described as an abnormal accumulation and storage of fat cells in the legs or arms. One of the most distinct signs that a person is suffering from lipedema rather than lymphedema would be if pressing on the skin will leave an indent (pitting) or not. The individual with lipedema will not show any indentation in the skin. Lipedema seems to affect almost exclusively women and while it can manifest itself at virtually any age, more current research shows that in most cases it has its beginnings during puberty. The condition is thought to be genetically inherited and dominant with the female gender. Lipoedema often has a characteristic appearance where both legs are abnormally enlarged from the hips down to the ankles, while the feet appear to be normal sized. This mostly hereditary fat disorder is masked by an ever increasing obesity rate in the population and is therefore still vastly unknown and frequently misdiagnosed. It is estimated that in the U.S. alone approximately 17 million women are suffering from this potentially debilitating and progressive disease. Stage 1 – The skin is still fairly soft and regular, changes can be felt (orange peel like skin with more prominent pores, skin feels like “Styrofoam balls in a plastic bag” when touched), thickening fat layer, tissue feels spongy like soft rubber. 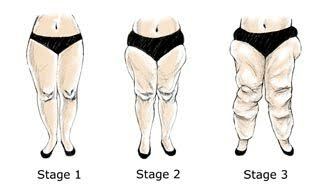 Stage 2 – Uneven appearance of the skin surface, fat layer becomes more irregular and tougher, large fatty bulges begin to form around the thighs, knees and ankles, edema may be common and does not resolve easily, hypersensitivity, possible skin color changes in the lower legs potentially signaling early signs of lymphedema. Stage 3 – The connective tissue becomes hardened and cannot be depressed. Large folds of excess fat and skin appear. Lymphedema may start developing. Some of this can be improved with therapy but some damage may be irreversible. Stage 4 – Irreversible edema, complications lead to lipo-lymphedema (lipedema with secondary lymphedema). Very large overhanging masses of skin and fat are present. Significant weight gain can affect mobility. Lipedema leads to considerable frustration and distress due to the distortive and obese like cosmetic appearance of the condition. Poor understanding of the disease among the medical professionals and care staff can make the psychological problems worse. Individuals with this condition suffer from low self-esteem, fear of ridicule and discrimination, which leads to social isolation and low activity levels. Some may also develop eating disorders. Anxiety and depression in lipedema patients needs to be addressed first before they can attempt to implement a self-managed therapy for their illness (for example wearing compression stockings to relieve swelling in the limbs from venous edema or if lymphedema is present as well). Please help spread awareness about this debilitating disease! We are trying to do our share helping to spread awareness and reassurance for the millions of women and some men in the United States who are afflicted by this painful condition. Undoubtedly this is a very real medical illness and should not be lumped together with the general spread of obesity in the population that is due to eating disorders.